HittyBelle and I had such a wonderful experience. 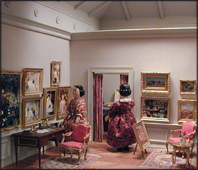 Esther took us downstairs to the room where she displays her miniatures and let us actually look around inside some of the rooms. We got to go in the Impressionist Art Gallery. 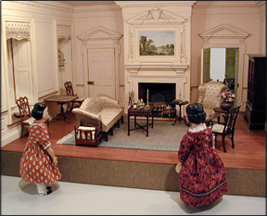 These rooms are really 1" to a foot scale so we were a bit large but we were very careful not to touch anything. The paintings certainly were beautiful. HittyBelle and I were both fascinated. When we went in the office of the gallery HittyBelle wanted to know about what was in the back room. She is very inquisitive! Esther explained that it was a room where all the paintings that had been sold were prepared for shipping. I was more interested in the documents on the desk. They were actual scaled down copies of bills of sale from the Paul Durand-Ruel gallery in Paris, France. He was the premier art dealer of the Impressionist. We both were amazed at all the detail that could be put into such a small space. After we left the gallery, Esther let us visit the rooms she had created from her visit to Giverny using various books. Giverny was the home of Claude Monet, probably the most famous of all the Impressionist painters. It has been restored and has many visitors each year. We got to see the dining room and the kitchen. The dining room is a very bright yellow. I think Esther said is was called chrome yellow. Even the furniture was painted yellow. Mr. Monet collected Japanese wood cut paintings and he hung most of them in the dining room. We both thought the room most interesting and beautiful. The room beside the dining room was the kitchen and it was quite a contrast. This room was decorated with blue and white tiles and painted in two shades of blue. There were many, many shiny copper pots and pans. Esther explained all these things to HittyBelle and me as we looked around. We liked looking out the window. Mr. Monet was most famous for painting pictures of the garden he had designed. Esther later took us over to the other side of the room and told us about her miniature house. It is called Twin Manor and it is the center piece of the Robertson's collection. 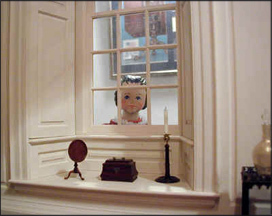 We were not allowed to go inside so we just looked into the drawing room and HittyBelle went around to the side and peeked through the dining room window. Esther said that someday she would show us the entire house but not at this time. She was pleased at the way we behaved so I know she will take us there again. I understand that the rooms that are being made for us will be in this display room and we will live surrounded by all these beautiful things. I do hope, however, that we will still get to spend a lot of time upstairs with the family and be able to take part in all the activities.